Meraki wireless access points allow you to meter and restrict Internet traffic on a per client of per SSID basis, and models with client Ethernet ports allow the same policy to be applied to wired devices. Yes, but the business has to pay for itself, if we don't make a profit then there is no point in running it. As for the £100k fttp, I see your point, we would enjoy it as well and it might increase the value of our property. However, there is a slim chance that we might get FTTP in 2021 and then we have thrown away a fortune for no reason when we could have paid the small mortgage off instead. I am not working, being confined to bed, and so I do not have limitless income. And we are too small. Janet can't handle the work as she is not well and we can't expand into more rooms as we do not have the land and would in any case not want to ruin the experience of solitude for the guest by turning it into a caravan park basically. We only have two rooms., and so people are not on top of one another. But coming back to FTTP, I could not sell that to Janet. I can do what I need now although it is a pain, and I can in fact cover the guests’ needs too because of the excellent 4G, but how to make that manageable? Basically one needs to think like a customer, which is easy because I used to be one and Janet is superb at that. She gets people coming back three times for instance and has incredible ratings on trip advisor and no complaints ever apart from the occasional outright loony or nasty piece of work. Like a vile family from Israel where the husband picked this place and then the wife freaked out about his choice and was wanting us to basically build a cottage for her at the last minute. I suggested to Janet that they should just go to a four star or five star hotel and then they would be happy. When they turned up the wife was just screaming at the husband about picking a wooden box in the middle of a field surrounded by mountains, which people choose just precisely for the features which she detested. Simply insane and did not read the label on the tin. Being extremely foreign was no excuse because english was excellent. But despite thinking like a customer, that has to be a sane one. If the customer wants everything including the moon on a stick they still have to pay for it, and if financially challenged then they are someone else’s customer. I personally find it really annoying when some things are not (apparently) free, and so others will think like that too, so those have to just be factored in and hidden away in the base price so that you do not disappoint. We are so overloaded with demand that I constantly suggest raising prices, but Janet knows best. We do explain to people why some things need to be paid for, however they are charged, and explain what things do cost us. And I think people appreciate that. We are not trying to take in more customers because we are booked solid all the time. Weaver, is it just your property or are there other locals with the same problem of not being able to get better broadband? If you are overloaded with demand and get a lot of return guests in spite of not having WiFi, why the hell are you thinking you need to provide it? If you get to a point where the occupancy rate is falling and people don't book after they find you have no WiFi, then would be the time to consider it. it appears you don't really have a problem. having WIFI as a selling point may attract the wrong type of customer anyway. @kitz I don't ever leave the house, so can't really speak for others, but I would think none of the other locals care about the internet anyway, as long as they can get an email, for those who do B&B and they can do that on dial-up, and those used to 500k know no different and certainly would never pay a penny more than the rock bottom. Young people might well be an exception, but they all leave. Everyone in the village does have DSL. It gets spectacularly worse as you go down the hill and add another 1200m to the line length, plus multiple joints plus the rf noise from houses. My neighbour at no 4 used to get the same sync rate as me before I worked on improving every last thing I could and went tuning- and hygiene-crazy. 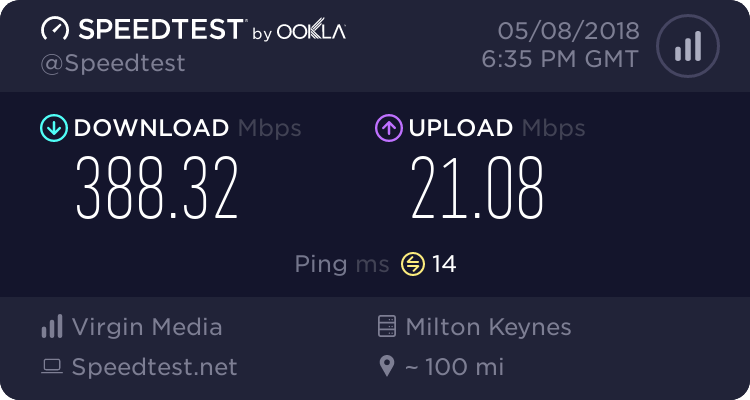 There are now some more English-speaking incomers whom I have not met and they might possibly be fed up about it, having been used to FTTC for all I know. Also one dutch native speaker, one of our two doctors, used to be four doctors. @jelv I don't think I need to provide it, which is why I have not done so. I am researching it in case expectations change a lot. If it could become a profit source though that would be an instant go. If I could advertise that superb internet is available, then some people might love that, if they are addicts, some might hate it because they want to be out of contact. I am i) looking ahead, being prepared ii) learning and iii) trying to see if there is an opportunity to increase profit by every side method I can, in case we have missed something. If we can delight guests and make some money then that is good. I think you have to track changes in expectations - look at the M&S disaster of some years back. I agree, I think, sort of. As well might even put a few off, as they would feel more guilty about lying to work and saying they are truly uncontactable. I know a couple of places where they really could be. That is really interesting - the unlimited Three thing. I wonder if there is an unlimited EE deal? We have EE 4G and Three 4G here. In my bed, at the wrong end of the bedroom, in a stone-walled house, the windows are looking east right towards the basestation. Perhaps I am too low, below the level of the window sill, or at the wrong angle slightly horizontally, but I usually get only 3G and rarely 4G in bed with my iPad. Just now 2 bars 3G. I could definitely look into that. new european ruling in the last week or so giving the public free use to do what ever they wanted to do with their sims. No idea if it's true, but if it is imagine the speed you could get if you used a setup with an external aerial, or something like this. Theres even a high gain antenna available for weak signal areas. I was just thinking that although AA's 4G service would bankrupt me because it is metered by the byte, there is an unlimited direct Three service which I could use which I was just tipped off about and I could run L2TP over that to give me access to AA's services and give me proper IPv4 addressing, IPv6, monitoring, no censorship or traffic-shaping or snooping, and all AA's other goodies too. That would save me a certain amount of money but the speed would be totally unpredictable. Too much hassle because I would be stuffed if it went down or went slow because of greedy users. It can be unreliable but this is not frequent although it does tend to die when there is a mains outage which I think is outrageous. I have probably said this before, but in my opinion, UPS plus generator should be legally required in order to safeguard people eg those who have health emergencies, road users and seafarers. That is really interesting - the unlimited Three thing. I wonder if there is an unlimited EE deal? We have EE 4G and Three 4G here. If it was not Free WiFi I would look for another place to stop . Have some bikes to hire them instead.